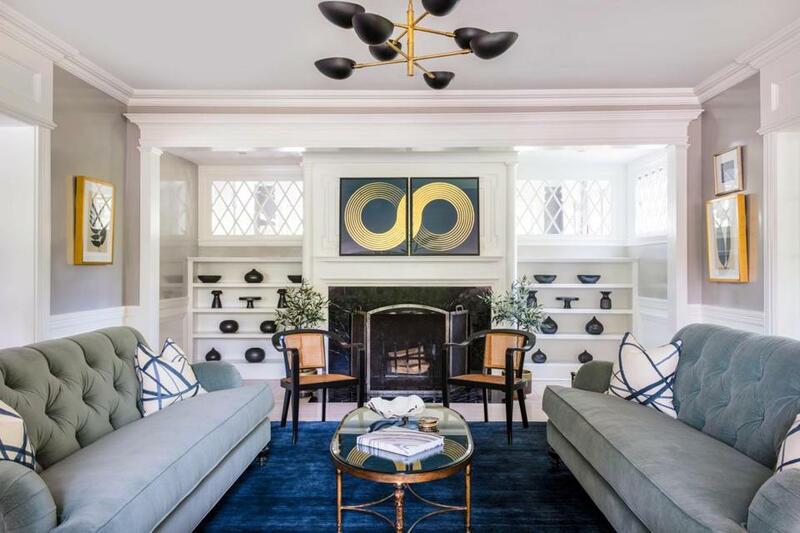 The living room in a Waban Victorian bridges the 19th, 20th, and 21st centuries. 1. The navy pile Armadillo&Co rug grounds the room and offsets the neutral tones. “Although it’s a single color, there are many variations within it,” says Anderson. 2. A pair of slate-colored velvet sofas by Roger + Chris provide structured yet comfortable seating appropriate for casual entertaining. Custom Kelly Wearstler pillows introduce the blue from the rug. 3. Anderson commissioned San Francisco-based ceramicist Bob Dinetz to help fill the space on either side of the fireplace. “I kept the bookshelves simple so they would not distract from the rest of the room,” she says of the array of matte black, wheel-thrown pottery in simple forms. 5. Brooklyn-based artist Lisa Hunt’s screen-printed diptych picturing the symbol for infinity is meditative, energizing, and unexpected. “The Studio 54 vibe sets the mood,” Anderson says.